Hi all, I'm back! To blogging, that is. 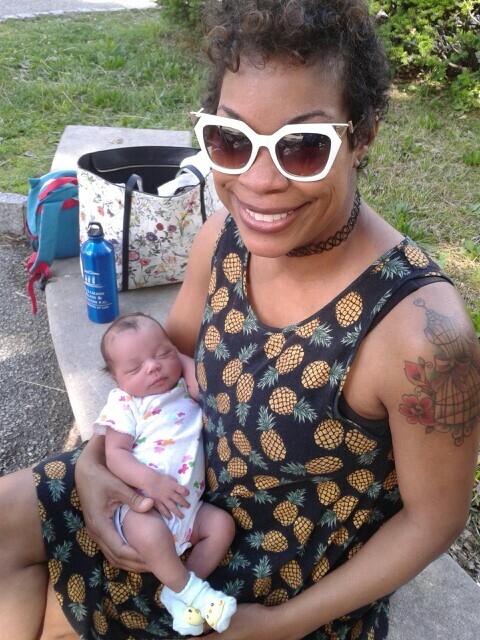 My brief hiatus was courtesy of the birth of my second little girl, Flora Lucile on May 20. For those of you who are baby-name dorks like me, a little background on her name. We initially found it in a baby book. I loved it instantly, and Brian liked that we could call her "Flo." It made the short list (along with Reese, Claudia, and Rosetta), but what catapulted it to number one was its relative rarity. Only around 100-140 little ladies in the entire United States are given the name Flora each year. Sold. (And the fact that it describes my favorite pattern did not go unnoticed.) In an awesome twist, we learned that her great-aunt also had the moniker. (We had wisely kept the baby name under wraps until the birth.) Lucile is for her great-grandmother. So far, she is living up to her name as a beautiful, unique gal. Doing her thing at the park, looking fashionable of course. A few weeks after Flora was born, I felt ready to meet up with some friends for happy hour. For my ensemble, I turned to a beloved (and stretchy) floral skirt and striped tank. The mixed prints ensured a standout look, while the belt helped define my thankfully-returning waistline. The photo shoot turned out to be a blast, as Ruby demonstrated her love of hamming it up for the camera. "Let's take a picture!" she squealed happily as I set up the tripod and camera. "Let's try again!" she exclaimed after each shot was taken. Now that I've got two daughters, I have no problem admitting that parenting, at times, is hard. Really, really hard. (I suppose that's kind of an obvious statement, but most social media feeds would have us believing otherwise.) It's a series of ups and downs - sometimes even simultaneously. Meltdowns over daring to give someone the "wrong" cup or not wanting to put on shoes? Down. Impossibly cute giggles? Up. 1980s Care Bears marathons? Typically an "up," except when they start at 5:30am and are done to the soundtrack of a crying, starving newborn. Unleashing my inner Tyra Banks with Ruby by my side? Definite up, photo-worthy moment. Full disclosure: I'm doing some major sucking in for this shot. Love the story behind her name! And Ruby is too cute.